Next post: Managed To Get a Great Shot of a Bluebird! Your Spanish friends will be well impressed with all that green.I hope the weather is good for you and your guests, enjoy London....I'm afraid London is far too busy for me. good job there. lovely stripes. Have a great weekend, and your lawn looks fab - can I ask what lawn mower are you using because I'm thinking of buying a new one. I used to have a suffolk punch but my brother ran it over with his landrover - years on I would love another one but they are so so expensive. have nice weekend too :))) Looks amazing!!! Thank you all so much for your lovely comments ..Kfunsters I use a Flymo Roller Compact 340 but without the roller bit because it is broken we got the mower with the house which was lucky think the stripes would be more pronounced with the roller. Denise we laid the lawn last year and did not do anything with it except water it alot but then after the first couple of cuts this year it was looking very patchy and my dad told me about a company called GreenThumb they basically come round four times a year they came to me and put a weed and feed on it about four weeks ago each quarter it costs me £15.50 which I think is very cheap and they guarantee the weed and feed does not burn the grass. The next time they come I think they get it ready for the winter. My dad has been having them treat his lawn for a few years now and his grass always looks brilliant. Thanks it certainly is impressive Nana, have good time. croquet!!! cant get more summery or british than that! ( with the obligatory G&T or Pimms) of course! 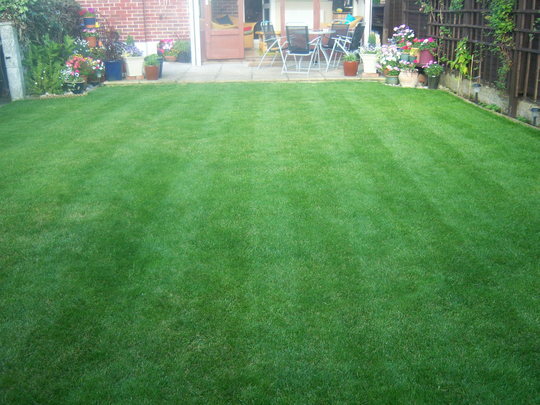 Beautiful lawn ... we also use greenthumb.